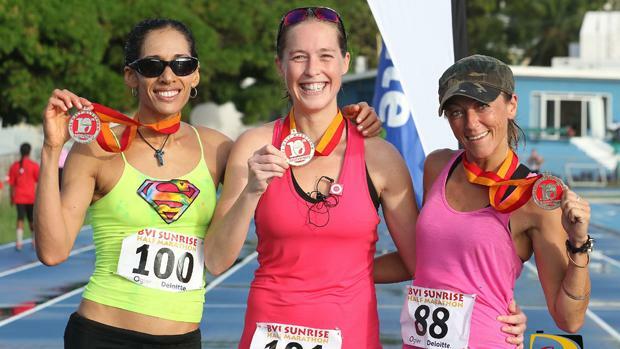 Ruth Ann David of the U.S. Virgin Islands, demolished the four year-old Deloitte-Ogier BVI Sunrise Half Marathon course record on Saturday, while counterpart and defending champion Shane DeGannes-the only 3-peat winner in event history-saw his streak snapped. The race was presented by the BVI Tourist Board and the BVI Athletics Association. David, who came within .10 of Meriel Stedman's 1 hour 34 minutes and 09 seconds in 2012, wasted no time in showing her hand, as she was among the top five for much of the first half of the race, before charging home in 1:30.46. With victories in 2013 and 2013, but missed last year's event, she joined the BVI's Rachel McDonald as the second three times winner. "I knew I could do it but I wanted to do one twenty something-1:29 at the highest-but it was okay," David said. "I felt good actually, it was just that I slowed down after the eight mile mark because I wanted to push for the eight and I shouldn't have done it, that was a bad tactic. After looking at the watch, I picked it up, was doing good then when the squall came through, it pushed me back a bit and I had to push through it." David, who was followed by the BVI's Katrina Crumpler in 1:39.30 and Virgin Gorda resident Kim Takeuchi in 1:44.50, said she knows she can get under 1:30 and getting the record was special, something she always knew she could do. "I want to bring it down lower," she said. "This is a nice course. This is the best Half Marathon I've ever run and I've run on five different courses." DeGannes controlled the race for the first half before St. Vincent and the Grenadines' Pamenos Ballentyne made his move and went on to win in 1:19.18. It was the fastest time since 2010 when Ballentyne was third in 1:09.50. DeGannes finihsed second in 1:24.09, followed by Virgin Gorda resident Vincent Fouriner in 1:24.19. "Shane ran a very good first half, he set the pace which I'm very happy about and he was about 50m meters ahead of me until we made the turn together," Ballentyne noted. "That's how I planned to run the race, to take the lead at the halfway point. I had a good race and finished very strong. Shane also ran a good race." "I backed off a bit and he kept hammering just under six minutes pace," DeGannes stated. "But, I'm not satisfied with the time. I always try to go under 1:20 here and I think Ballentyne did that. Once he ran away from me, I lost sight of him and hanged on to second place. I have St. Croix Half Marathon this weekend and I wanted to hold something in the tank." "This event was just flawless, really have to give thanks to the Royal BVI Police Force who were out monitoring the route they were fantastic," Reddy noted. "We had lots of spectators in the course so thank to the community for the support." Race founder Simon Cook who was 15th overall in 1:44.20, described the race that had 141 participants 89 of them as individual entrants the others on relay teams, as 'absolutely awesome' and it was great to see so many people out. "When we started, we started in the dark in West End and there were n lights," he fondly recalled. "Here this morning, we have the big lights on, (on the A. O. Shirley Grounds), the new track down and we had such good support on the road. I've been really blessed to be in the BVI and take part in such an awesome race." "You know, I didn't run as a kid; I didn't run when I was in my 20," he noted. "I used to suffer badly from anxiety and depression and started running and sorted that out. I came here, people were running and we did the Half Marathon and to see all these people out and enjoying themselves, living life, is just great, really great." 7. Rodrigo dos Santos 1:35:18. 9. Alexander P.I. Dale 1:37.37. 16. Michael L Sheesley 1:51:04. 19. Adrian B. Dale 1:52:15. 22. Shaun Reardon John 1:54:03. 23. Shane P. Donovan 1:55:34. 24. Adam De Monte 1:57:04. 26. Daniel C. Mitchell 2:03:16. 32. Dr. Garfield Neita 2:19.06. 33. Jim W. Cullimore 2:34:11. 35. Liam J. Hardie 2:44:34. 1. Ruth A. David 1:30:46.18. 4. Rebecca A. Paull 1:45:56. 6. Rosmond A. Johnson 1:48:04. 8. Rachael F. McDonald 1:52:34. 11. Jenny L. McIvor 1:53:29. 12. Ami L. Sweeney 1:55:20. 17. Lauren H. Julien 2:01.29. 18. Ni Made Oniasih 2:03:04. 19. Anna M. Kinkead 2:04:54. 25: Kerry-Ann dos Santos 2:09:04. 26. Natasha H. Ruscheinski 2:09.04. 28. Melisande F. Rowe 2:11:36. 29. Rhiannon D. Jones 2:13:13. 34. Natasha C. Gunney 2:27:00. 36. Barbara M. O'Neal-Rhoden 2:42:09. 37. Nedy Ador Dioncio 2:46:55. 38. Jenny A. McConnell 2:50:16. 39. Shirley Patricia Liburd 2:50:22. 40. Jill R. Farley 2:57:50. 1. Harneys 1: (Gregory Boyd, Ian Montgomery, George Weston),1:49:41.69. 2. Grant Thornton: (Sam Ouriach, Paul Frey, Simon Cross), 1:58:10. 3. Appleby Adam and the Ants, (Adam Holdt, Judy Haycraft, Andrew Willins), 2:00:13. 4. Harneys 2: (Jessica Brodrick, Natalie Bell, Macia Payne), 2:02:32. 5. Team Krys: (Robert Shiffman, Sean Cordes, Sarah Duncan), 2:03:46. 6. KPMG Spartans: (Stephen Langford, Lucinda Ford, Lovat Carnelly), 2:08:07. 7. Deloitte1 (Dylan Bobb, Tia Beckmann, Sophia Addas), 2:09:02. 8. Deloitte 2 (Aurelie Legagneux, Shevon Williams, Maria Kristina Balangatan), 2:15:10. 9. Team Carey Olsen: (Sharon Mungall, Rachael Matthews, Andrew Chissick), 2:22:07. 10. BDO Binder: (Jovan Van Heerden, Ryan Geluk, Florencia Taray), 2:36:22. 11. Harneys 3: (Shonda Alfred Leacock, Rahel Worede, Richard Parchment), 2:37:17. 12. KPMG Formidables: (Catherine Jackson, Kerry George, Khoyisha Stoutt), 2:56:51. 1. Tek Dat: Marvin Flax, Julien Johnson, Chris Smith, Barbara Pinnock-Smith, 1:52:00. 2. Team Elizabeth Ricardo, Richie Paul, Jules Potgeiter, 1:55:50. 3. Team Guy-Paul Dubois & Dara Smith, 2:07:39. 5. Team Katie Morley & Katalin Harmat, 2:21:09. 6. Team Brodie Faragher and Sofia Faye 2:28:24. 5. Cedar Grade PTA (Anna Kinkead, Rhiannon Jones, Garfield Neita), 6:39:13. Spirit of the Event - Team USVI - we love you Guys!